For the Arts in Conversation podcast #3, I was lucky enough to interview the artist Jade Montserrat about her exhibition Rainbow Tribe: Affectionate Movement R&R at Space, London from 18 July - 7 September 2018, curated by Pro-Numb. Jade, alongside curator Chris Rawcliffe, began this project to address the art world's and art institution's deep-rooted racism, gender inequalities and discrimination against those from “protected characteristics". Their work presupposes that an Affectionate Movement requires prioritising the urgency of a care-centred approach within the highly sensitive terrains that marginalised artists navigate. In this podcast, we discuss the exhibition within her wider practice, her use of charcoal, her collaborative practice and her belief in a 'care-centred pedagogy'. It was recorded live on 25 July 2018 in the exhibition space and edited for broadcast. Jade Montserrat lives and works in Scarborough, North Yorkshire and is the Stuart Hall Foundation practice-based PhD candidate at The Institute for Black Atlantic Research, The University of Central Lancashire (2017-). Montserrat works at the intersection of art and activism through drawing, painting, performance, installation, sculpture, film, print and text. The artist interrogates these mediums with the aim to expose gaps in our visual and linguistic habits. She graduated from the Courtauld Institute of Art in 2003 and Norwich University of the Arts in 2010. Recent selected screenings, performances and presentations include: Arnolfini, and Spike Island, Bristol (2017), Alison Jacques Gallery (2017) and Princeton University (2016). Montserrat works collaboratively with artist and performance collectives including Network 11, Press Room, the Conway Cohort, Rainbow Tribe: Affectionate Movement and Ecology of Care Bureau. She is the recipient of the Jerwood Drawing Prize student award (2017). Installation of By the Deep, By the Mark, Somerset House. Photo: Tim Bowditch. Courtesy of the artist. Eloise Hawser’s work spans print, sculpture, performance, video, sound and everything in between. She has exhibited nationally and internationally, and her first institutional solo exhibition Lives on Wire was presented at the ICA in 2015. She is a nominee for the 2018 Max Mara Art Prize for Women. Heavily research driven, the London based artist often makes work in response to societal structures found within architecture and machines, and our body’s relationship to digital shifts in technology. Born in 1985, Hawser sits upon the cusp of the Millennial and Gen X generations, growing up with some basic IT knowledge, but keeping pace with the increased technological advancement whilst navigating her art practice. Her fascination with ‘how things work’ is never more present than in her latest exhibition at Somerset House, By the Deep, By the Mark. 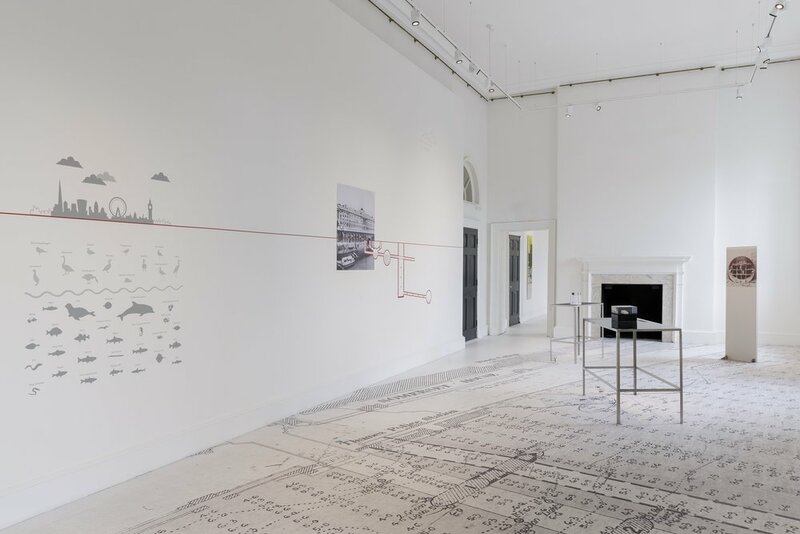 Over the last two years, Hawser researched Somerset House’s relationship to the River Thames upon which it sits. She connects the historic civil engineering used to create subterranean sewer systems with innovative medical imaging machines which measure the liquid flowing within our own bodies. Through the appropriation of 3D imagery, archival prints and one-of-a-kind medical objects called ‘Phantoms’ (specially designed objects used to test medical imaging equipment such as X-Rays, MRI and CT scanners in place of a human), Hawser brings together a stunning three room sculptural assemblage. I caught up with her at Somerset House where she also has a studio, to talk more about this impressive exhibition. Can you talk a little about how this (two-year) research project first came about? I had started to look at on-screen simulations of water, a process known as CFD (Computational Flow Dynamics). The software does not allow you to model water, as it is too expansive and unbounded, so you have to use an algorithmic package to determine how it forms. This means that within the software the “water” has its own behaviour, not imposed by the human hand or modeller. While I was investigating this area, I had moved into a studio in Somerset House, where I learned about the buildings very close and important historic link to the River Thames. For example, it still has a (now-truncated) water gate from a time when boats were steered right into the internal flooded courtyard. This changed entirely with the building of the embankment in the late 1860s, from which time Somerset House has been separated from the river by a wide stretch of pavement and road. All of this played into an idea that interested me, about the manipulation of nature; about pushing the natural flow of water away from buildings and human constructions, thereby taming and directing it. In the 1860s, the Victoria Embankment formed a kind of first frontier against labile nature as represented by the flowing river. 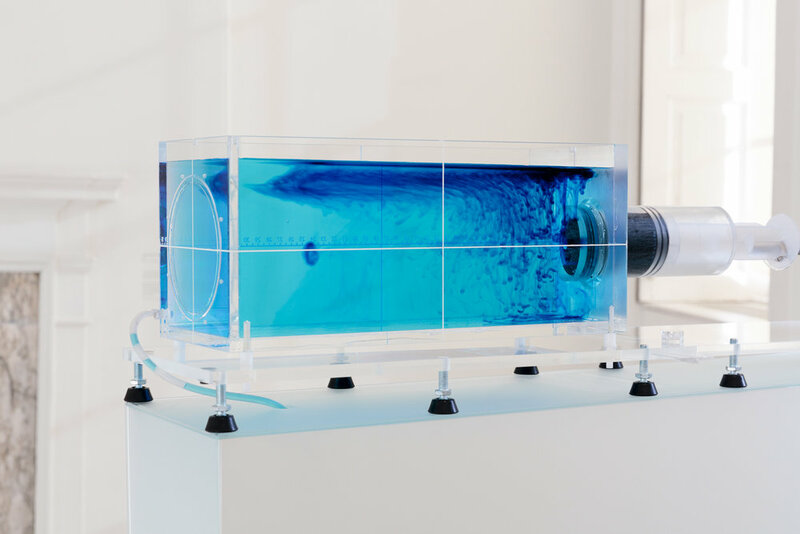 My show is concerned with such attempts to monitor, measure, map and control the unbounded flow of liquid life, how the transfer of dry screen-based calculations can be applied to the world, whether within our own bodies or out in the wider world. Trace passageways – now these technologies model real physical scenarios. At what point did you start to make the connection between the sewer system designed by Joseph Bazalgette and the bodily flow of liquid through the body? Bazalgette created the first linked, covered tunnel system conveying London’s foul water downstream. But Bazalgette’s sewers are gravity sewers, each with a large ovoid aperture (for backsplash). In the human body, by contrast, the heart is a pump and our blood flow is pulsatile (meaning it is pressurised when we stand up). When it comes to the software technologies that help in simulate and predicting the flow of water or gas through pipes and apertures, there is some superficial overlap in the such as methods; Computational Flow Dynamics (CFD). However, there is a larger issue with which the show is concerned: control. I am fascinated by human attempts to control and manipulate flow: of water, gas, or blood. Our ever-increasing ability to measure and control through continual advances in technology, seems like a kind of “playing god”. While Bazalgette’s sewer was an intensely physical project, and hundreds of hard-labouring bodies manually cleared the subterranean tunnels, (an image of them, caged and contained, is included in the show), nowadays computer models, codes and algorithms can take their place. This new way of doing things is far removed from the direct physicality of bodies working. This seems particularly apt when we consider how controlled or manipulated we can become through digital media like Facebook, as potentially witnessed through the recent Cambridge Analytica scandal. But even before this, Britain’s manual labour was slowly being replaced by computers and machines, changing our economy to a service industry rather than a manual one. This has echoes of your other work, such as Lives on Wire at the ICA in 2015 where you programmed a machine (a vintage organ) to conduct an orchestra – like they used during silent movies. Who knew technology would not only physically change us, but socially and mentally too? Do you feel technology has now taken a more sinister turn? There are no social media technologies featured in the show, and I would stress the fact that the technological developments on display have been immeasurably beneficial to human life: both the medical imaging devices, and the sophisticated design and engineering technologies that have led to vastly safer ways of constructing large pieces of infrastructure, such as sewers and tunnels. In Bazalgette’s era human workers laboured in considerable danger, and loss of life and limbs was common. The purpose of ‘seeing machinery’, such as MRI and CT scanners, is to better understand physical and natural phenomena, not to take their place. Indeed, all the technologies in the exhibition either aim to create more accurate readings of the workings of the body, or to predict and project possible models into the world, for us to then evaluate and develop. What I find so interesting about all of these devices is that, as well as showing how quickly technology is progressing, they, in turn, expose how little we really know. Medical phantom producers have created some innovative physical objects to assess how accurately MRI and ultrasound are comprehending flow systems within our bodies. However, what these objects show is that, whilst we are inching toward more accurate readings, the technology still has considerable blind spots that reveal just how mysterious remain the human body’s patterns and movements, continuing to elude the grasp of machine technology. For me, this is quite a nice antidote to the much-discussed idea of overwhelming machine intelligence and control. The subjects you explore in the exhibition are so layered and complex, especially as you delve deeper into each subject. How did you narrow down the parts of research that you really wanted to explore through the exhibition display? Or to put it another way, how did you decide what you wanted the audience to see and experience through your work? I had a loose framework, in which I linked various objects and data relating to works along the river from various points in history. I found survey maps of the river bed, fully rendered CGI vistas showing London’s skyline from the water, subterranean models of the 2020 super sewer that would never otherwise be seen by human eyes. It is a miscellaneous and subjective – and, to me at least, compelling – selection of items showing how we have simulated and manipulated the river at different times, and how we are continually advancing and updating these. In formal terms, I became interested by the fact that some of the material had very rich, vibrant colour schemes (bathymetric surveys, for instance, which map depths of bodies of water). Early on in the research process, I was lucky to be put in touch with an engineer at Thames Tideway called Stuart Williams. Stuart showed me how he had analysed some drawings of the Victoria sewer by Bazalgette (courtesy of the Metropolitan Board of Works) in order to work out where to incept the overflowing Victorian sewer. This appealed to me, the idea that these old drawings were essentially still ‘live’, in that they are still vital technical starting points for 21st century engineers. Today, Stuart’s 19th century drawings constitute one cog in an advanced and packaged file BIM containing vast quantities of data relating to everything from hydraulic models to air-flow models, and even sound recordings taken inside the sewers. However, it all started with very literal, simple sketches approaching the problem of dealing with overflow in the system, which is itself caused by a huge increase in London’s population. It’s tempting to think that such large-scale infrastructural projects are remote and inaccessible to most of us, but my correspondence with Stuart seemed to suggest otherwise. Finally, during the process of gathering together my research, I also discovered medical imaging phantoms. Nowhere are the advances in technology and flow-modelling, as described above, more relevant than inside the human body. The objects and images on display are so beautifully crafted and positioned. Did you see each room as a complete installation? Or do you view the entire exhibition as operating as one large flowing installation? Cholera map of the metropolis of London. 1849. Installation of By the Deep, By the Mark, Somerset House. Photo: Tim Bowditch. Courtesy of the artist. A section from a 1928 Port of London Authority survey map runs the length of gallery one and two. It depicts the depths of the river bed outside Somerset House as it was then, measured meticulously and showing depth increments through careful lines and shading. It is the reverse of a topological map, in that it maps depth below water rather than height above it. Also in the first room is a sculpture of the Victoria Embankment, which follows the windings of the river. It is based upon Bazalgette’s 1865 engineering blueprint, which shows a cross-section of the embankment. There is a section missing, where the new Thames Tideway sewer will be fitted in. On the mantelpiece is a model of this interception, with the sluice gates that will drive the water downwards. Galleries 1 and 2 represent models relating to collective, large-scale, highly complex endeavours to deal with overflowing sewers: an unglamorous yet utterly vital and highly technologically sophisticated underpinning of the city’s life. The final room returns us to an anthropomorphic object laid out on a raised platform, tracing a journey back to the single human figure. The range of collaborators you worked with is impressive: surgeons, PhD students, Biomedical Engineers, Civil Engineers. Had you worked with so many disciplines like this before and how did you find this? Did you find it was easy to make the connection with them between the arts and their fields of science? No, I’ve never worked with so many collaborators before; this was the first time for me. A big part of the work was about communication: building a dialogue between our very different worlds of art, science and industry. It’s quite a feat to get medical devices like the Phantoms on loan for an art exhibition I imagine. The way you constructed the body in the final room must’ve been really fascinating for your collaborators to see. How did they respond to the exhibition? The phantoms are manufactured with such intense precision and care, so I don’t think it was a big leap for the people who manufacture them to imagine them in an art context. In my initial conversations with the phantom-makers, I discovered just how time-consuming and painstaking the production process is. Indeed, these unique objects are treated with a certain reverence by their makers. My request to display them in a gallery, then, was not such a surprise to their creators. Most of the people who lent objects attended the show’s opening night, which I was thrilled about. What is more, some of them, such as Simone Ambrogio, have since been back to see it again. I was very inspired by the passion and attention to detail displayed by the scientists and engineers I met. They responded really positively to the idea of a lay audience engaging with the work they do so lovingly, and agreed with me that the public would find these items interesting, even though they are highly specialist. One doctor involved in the show, Dr Fenner, who leads a team researching blood flow vortices, is absolutely passionate about his area of research, and believes that the medical objects he uses in his work would be a source of fascination for many people, if they were only more accessible display to the public. I was struck by this desire to share his field of expertise and enthusiasm with a wide audience. In fact, in a sense, perhaps, I was an initial audience for this show. I am not an expert in science or engineering, and I wanted to demystify the idea of the artist as appropriating and claiming authority over objects and phenomena from other fields. The exhibition recontextualises some wonderful things but I hope it does not seek to force other meanings on them by transforming them into sculptures. Is nearly everything in the show appropriated from existing objects and images? I am thinking about the sound piece you made which sits in the window in the last room with recordings made of the river. Did you record those? Was this just for aural effect – a reminder to the viewer of where it all started? The piece includes sounds from leisure boats, working boats and barges, as well as the Tideway piling and a Thames's clipper sampled from Limehouse beach. 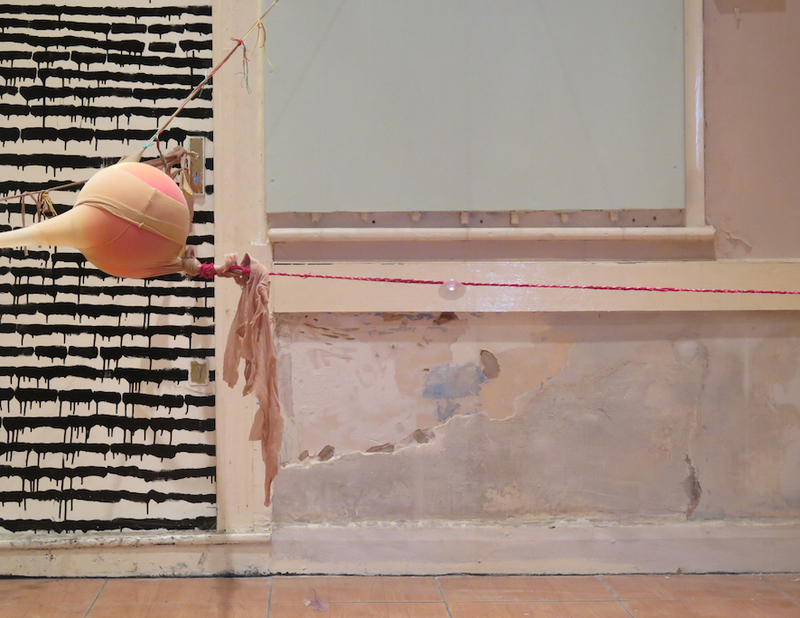 The piece grows very quiet at times, as it focuses on individual sounds such as a winch or a creaking rope. There is also an unidentified human voice in the work: that of a tour guide from City Cruises, who has worked on the river for years. He introduces landmarks with a very droll delivery – and a dose of suspicion. The recordings were made by a friend of mine, Laura Mitchison, who runs oral history cooperative On the Record. Almost everything in the show has been appropriated from existing objects and images, although they have been re-drawn or reproduced in a new medium and, of course, recontextualised in the space of the gallery. The one exception is the glass tables for the medical phantoms, which I built from scratch. By the Deep, By the Mark is on at Somerset House, Terrace Rooms, South Wing until 22 April. Eloise Hawser will be in conversation with Sir Peter Bazalgette, the great-great-grandson of the Victorian civil engineer Joseph Bazalgette on 10 April. Full details, and a video about the exhibition can be found on the Somerset House website.